The Sisters are doing another challenge for Spring! Hoo-who! I’m in. Overall this year I’ve been doing pretty good. With the help of Weight Watchers Online, and the support of my husband, I’ve been on a downward trajectory (in weight, not my life!). The last two weeks, however, have been challenging. I traveled to New York City for work, and was totally out-of-control with my eating. On the other hand, I walked A LOT! That week I ended up maintaining my weight. This past week, we’ve been doing work around the house and had guests for the weekend. Again, eating is out-of-control — right now I don’t have access to my kitchen (and haven’t for a couple of days), so we’re eating out…and not picking the healthiest meals. This week I did lose a tiny bit, and I assume that’s because Saturday I carried boxes and boxes and boxes from the basement and because we walked with our guests about 5 miles in DC. But just imagine if I had started eating right *and* all that exercise! That’s the next plan! First up, I’ll be examining my goals for the next 6 weeks and coming up with an inspiration board (probably on Pinterest…come find me). Still mostly on track, I think. I lost another 2.4 lbs this week for a total of -6 since the New Year. Definitely going in the right direction! So, what’s going right? I’m exercising – at last week I got out for a “run” on Friday and Monday. I’m working my way through the Couch to 5k program, and just finished week 5 – the final run for week 5 is a single 20-minute jog interval. And I (mostly) did it! (There’s a hill on my route, and I had to walk the steepest part of it, but picked right back up at the top, so I’m counting it.) I also continue to go to a personal trainer twice a week for a 1-hour weights workout. So, total workout time: 3 hours. What’s not going right? Weekends are still a struggle. I think I’m doing better. I’m not eating as well as I could, but doing better. I know that the-year-that-shall-not-be-named was hard, and you felt completely beaten down at times. I promise that 2012 is better. Promise. For starters? You finished couch to 5k in March! That’s right, you were able to run…okay, jog…5k in March. Go you! That’s when the biking training kicked in – you and Andrew trained for a Spring half-century. Not an organized ride, but another one with just the two of you. And you did it over Memorial Day. Bonus? You did it a little bit faster than the one in 2012. And, you kept seeing Gary throughout the year – those personal training sessions have made us much stronger. Those healthy habits are starting to stick, too. Clearly we’re getting the exercise down. The eating? Well, that’s coming, too. Not quite as easy as the exercise, but it’s coming. We’ve celebrated lots of non-scale victories this year, from loads of fruit and veggies in our diet to turning off the TV a couple nights a week. There may even be a couple pairs of new (smaller) jeans in the closet. Lots of other stuff has happened this year, too. You are much happier at your job now (I won’t tell you if it’s a new one or not — some things you’ll just have to wait to find out!). And the new house? It’s fabulous! A huge yard for Aurora, great kitchen, and a garage for Daisy, the Model A. I’m hoping to get Daisy out and about this Spring – her engine is rebuilt and has a fresh coat of paint. There’s still some body work to do, but she’s in great shape. Dad would be happy to see her like this. Yeah, there are a few set-backs this year, but, as always, you power-through them. If 2011 has taught you just one thing, its that you are a strong woman who can handle anything that comes at you. So, the assignment this week (okay, last week, but I’m getting to it this week, so shut up) was to write our new Dear 2012 Self letter from the perspective of our 2013 self. Before doing that, I wanted to revisit my letter from last year. I’ve been dreading this Let’s just take a look at it, shall we? What an optimist person I was last January…so little did I expect what the year would bring. I’ve been a little mad at 2012 me for not warning me a bit about the year, but I’ve come to realize that I needed that optimism to survive the year. January 2011 me would never have thought she could survive everything that I know she has survived. And here I sit in January 2012, nearly as optimistic about 2012 as I was last year about 2011. I’m ready to tackle another year – ready to start again. It’s 2012! The-year-that-shall-not-be-named is over!!! I have decided that 2012 is the year of renewal. 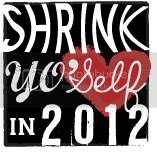 Part of that is jumping in with The Sisterhood on the first challenge of 2012, Shrink Yo’Self in 2012. I’m a bit behind on the assignments so far, but I’m gonna catch up! First up? Goals for 2012. As I said, my word for 2012 is renewal. This is for all aspects of my life. I’m looking for a new house this year, a new job, and a new attitude. I want to look at my non-scale victories rather than the scale itself — I will trust that the scale will follow. Continue seeing the personal trainer. I’m hoping to continue with twice a week, but it is a bit expensive, so as the year goes on (and we start looking at buying a new house), I may have to drop to once a week. Quitting altogether is not an option. Finish the Couch to 5k training. I’m looking into 5ks to run in the spring with a friend — so April or May, here I come! Train for another half-century bike ride. I’m hoping this will happen relatively early. Our schedule with the house might interfere with our being able to get in all the training rides we need, but I’m hoping to do one over Memorial Day weekend. Participate in the Backroads Century again. This will be the 30-mile option again, but if we can get stronger at this ride, and do it a little bit faster than 2010, I’ll count it as a victory. Train for the Walt Disney World Half Marathon. My original plan was to walk it. Now I’m not so sure. I doubt I’ll be running the whole thing, but there will be *some* running for sure! Drink more water, drink less pop. I’m not going to cut out pop. I like it. But I can minimize it, and make it so I don’t feel dependent on it. So, working up to 100 or more ounces of water per day. Eat fruit! This has always been a struggle, but if I keep fruit in the house, and keep some on the counter in plain view, I tend to eat it. So that’s it – 3/day. Balance. I want to find the balance in my diet. This *might* entail joining Weight Watchers again, just so I have some accountability. Not sure yet. I know I won’t completely cut out junk, but I really need to put it in its place – it is a treat, not a staple. I don’t know why, but I feel like I need a fresh start, a clean slate. So, even though I’m still down 10 lbs from my highest weight, for 2012 I’m resetting the scale. Ugh. I’m up. Not much, but not the direction I was hoping to go. I know the problem…it’s *always* been my problem, and it’s name is “weekend”. During the week I’m at work where I have a lot of control over what I eat — I bring my breakfast, lunch, and snacks. Sure, there’s a vending machine, but as long as I’ve packed breakfast, lunch, and snacks, I rarely visit it. Weekends, though, are a whole other story (and I have to include Fridays in there, because I work from home). I can eat anything in the house! Whenever I want, whatever I want, all day long! Yeah. Therein lies the problem. It’s not like we keep a lot of crap in the house, but if I have the choice between an apple and tortilla chips and hummus, I’m going to choose the chips. Every. time. So, goal for this week is to make better choices over the weekend. The 3 fruits/3 veggies/3 dairy is going fairly well during the week (not hitting every day perfectly, but getting more than I used to and certainly more conscious of what I’m eating). Perhaps the more concrete goal will be to go for a fruit over the weekend at least once, instead of something else. Oh, and I managed to exercise a few times this week – not huge amounts, but a little more than last week, with a total count of 140 minutes. Goal this week will be to up that by at least a little more. Finally heading in the right direction thanks to my tribe-mates in Tribe Teal Tackling Tons! How did I do on last week’s goals? The main one was to get in 3 fruits, 3 veggies, and 3 dairy servings each day. I did really well the end of last week on this – I think I only missed a fruit or veggie one day. The weekend, though, as always, was a challenge. Okay…the weekend was an epic fail as far as nutritional eating. I’m getting back on track this week. I managed to get in some exercise – my weekly workout with the personal trainer, walking on Saturday, and playing on the Wii Fit yesterday. I’d have liked to do more, so that will be a goal for this week. Oh, the Sisters also had a mini-challenge to avoid fast food. This one is not really an issue for me – I’m vegetarian, so my choices at many of the fast food joints are not exactly abundant. This upcoming week’s challenge is to get at least 7 hours of sleep per night – that’ll be more challenging. That’s it…my plan is to just keep going. Okay, so I disappeared again. I wasn’t ready last time, or I gave up too easy, or something. But I’m back an in Tribe Teal for Shrinkvivor over at The Sisterhood. I’m still having a hard time now and again (Which is hard to deal with, because I keep thinking I should be doing better by now…I can’t judge my emotions, though, just need to deal with them and keep moving forward.) But I think I’m ready to commit to doing better for myself. I *have* been exercising since the last challenge. Not always as much as I’d like, but more than nothing. In fact, I’ve been going to the personal trainer every week since I started in June. Most weeks I do other work-outs, too — I’ve biked more weekends than not this summer, I’ve tried to get out for walks, and I’ve even pulled out the EA Sports Active and Wii Fit Plus a couple of times. I’d like to get more regular about my exercising, though. Exercise: continue with the personal trainer; do at least 2 other workouts each week. Eating: Brooke and I are in the same tribe, and have decided that we are *not* going to obsessively track our food – for me that usually turns into a binge-laden rebellion. Instead, we are work on getting in 3 fruits, 3 veggies, and 3 dairy servings each day. That’s it – simple, right? Ha. I didn’t want to check in this week. I didn’t eat well. I didn’t exercise. I did nothing in aid of my journey here. That’s not entirely fair. No I didn’t exercise, except for a couple of walks to the dog park with Aurora. But, while I didn’t eat better than, say, last week, I did eat better than my “old self”. I’ve been enjoying the fruits and veggies of summer – raspberries, black raspberries, cherries. However, I made a huge step yesterday. I let my friend Lorna talk me into going to a personal trainer with her. No, you didn’t read that wrong. *I* went to a personal trainer. I hate having other people see me work out. I hate letting other people know my weight and measurements. Did I mention that I hate letting others watch me work out? Yeah. but I went. I weighed-in. I got measured. I worked out. I sweated. And I’m going back. Once a week. For at least five sessions. ‘Cuz I pre-paid. He’s having me keep a food diary. That I will *send* him. Ick. On the other hand, just keeping the diary seems to change my choices. Right now I’ve been contemplating a snack, but I don’t want to write it in my diary, so I’ve been avoiding the kitchen. Of course, part of that might also be that my legs, arms and shoulders are sore from yesterday’s workout. His other goal for me this week? Get on the bike once, if even for just 15 minutes. I can do that. I big puffy heart all of my sisters over in the Sisterhood. I missed about half of everyone’s comments last week, ‘cuz they went into moderation and WP didn’t send me an e-mail. Now I’m bawling my eyes out (in a good way) from all the support. Thanks everyone! I’m not at 100%, but I’m trying to get back in the groove. I’m chalking this week up to a success. I ate more fruits and veggies most days than I have in a couple months – and on several occasions, I actually craved a fruit instead of junk. 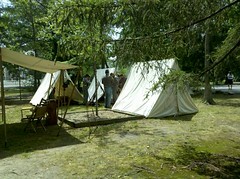 Saturday my husband and I hopped on our bikes and took a short ride up to town for Civil War re-enactments, including costume, crafting, artillery, and telegraph demos. It was only 7 miles total, but that was just about right for me at this point  I’ll build up miles and time over the summer. Oh, and believe it or not, I also did the Shrinking Jeans Bootcamp W1D1 workout last night. Plus, afterwards, I pulled out my hula-hoop for 10 minutes. Yeah, that’s right. I worked out after the bootcamp. Yay me. Weight-wise? Not as great, but I’m not worried about that right now. This week I’m just going to keep going – SJ bootcamp, biking over the weekend, and getting in some fresh fruits and veggies.